In the past, I and my wife used to visit the Demänovská Valley very often. This region has always offered many opportunities for skiing, hiking and cycling trips. We regard Chopok to be the best skiing destination in Slovakia. It was this region where we got the idea to run our business. We got this opportunity very soon and we took on this challenge. We put our idea into practice and in 2009 we built a new Guesthouse DRAK. We kept on looking for our place in market and our clear goals and developing our business philosophy. We called our guesthouse after a dragon whose “house” was situated in one of the Demänová caves, as the legend says. 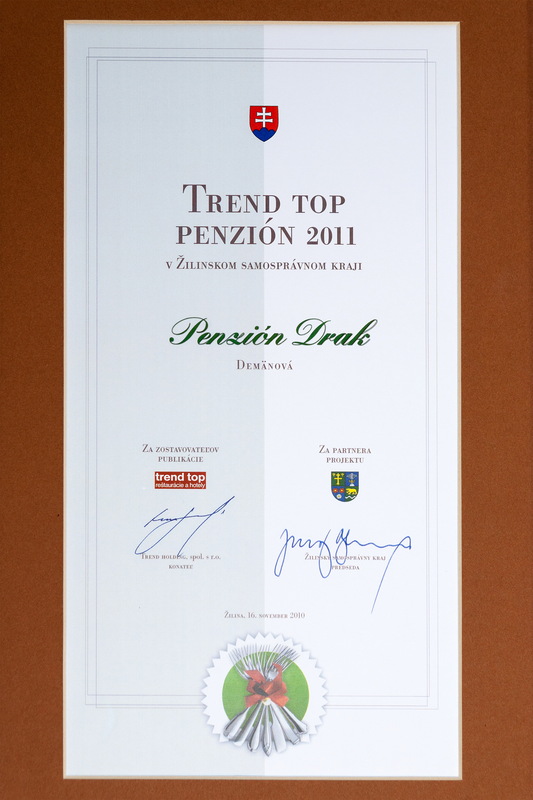 magazine TREND which called us the TOP Trend Guesthouse in Slovakia. However, what we appreciate most is that we can still be here for our clients and guests and that we really enjoy it. with a clearly specified goal and services comparable to standards in EU and Switzerland.